As dry as it is, and with the humidity low, I was really surprised to find this spider web this morning. In fact, I spotted 3 in my 4 mile walk - sure felt good to be out early. Amazing. You get the BEST webs ever. 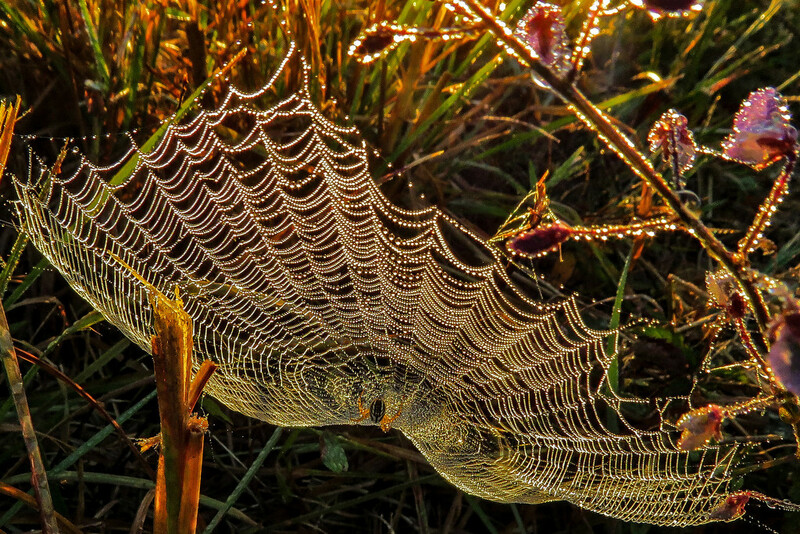 Love the quality of light and web. Fav. Oh my! What a fantastic capture!! I always think of you when I see a dew-drenched spider web. Holy Dina! This is incredible! Wow. Beautiful capture with great lighting! I think this is your best one yet. Spectacular shot and a FAVe for me. Congratulations Milanie! Very much deserving of making it to the Top Twenty! Amazing shot! Was so thrilled for you to see it on the TT. Congrats. Awesome, what did you do to process this? Flipping gorgeous!!! The lighting is wow. That was some reward for being out early. What a stunning find and superbly shot. FAV - again! Great shot.. Belated congratulations on Top Twenty.